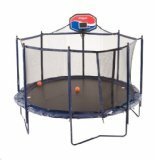 Trampoline basketball is a fun, exciting way to take your game to new heights! 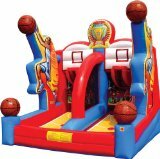 Surprise your kids with their very own inflatable bouncer or trampoline with basketball hoop. Many of us who love to play hoops will never have the thrill of slamming the ball through the goal. Most of us don't have the size or athletic ability to soar through the air like that. 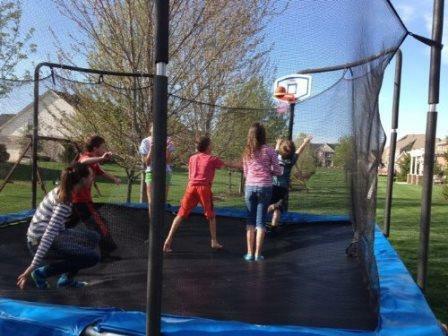 That's one of the reasons playing basketball on a trampoline is so much fun! It gives kids of all ages the chance to experience soaring above the rim. With the close quarters and bodies jumping around uncontrollably at times, I would highly recommend a smaller, softer version of a basketball. JumpSport has a small 7" squishy ball that would work really well. A nerf ball or other small, soft inflatable ball that bounces would work also. 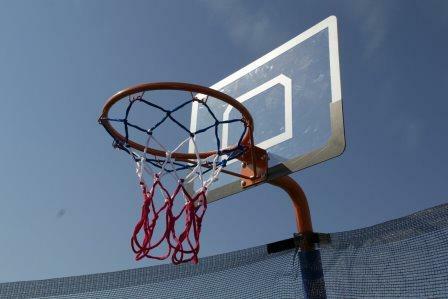 The basketball hoop and its steel pole mounts on the enclosure net. 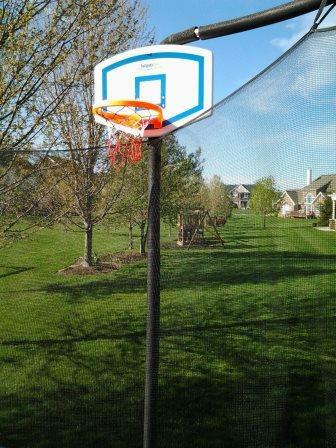 Backboards and rims are constructed from a variety of materials, like stainless steel or molded plastic. Some models even have a cushioned rim to protect the arms and heads. 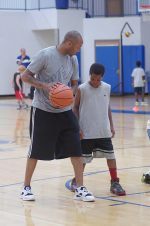 Your selection will definitely depend on the size and age of the players who will be using it. Another fun way to play trampoline basketball is to find an indoor trampoline park in your area. These facilities have wall to wall trampolines that even angle up the walls, allowing players to soar toward the goal from all angles. My daughter has gone to one of these jumping facilities in our area with a group of friends and had a blast! 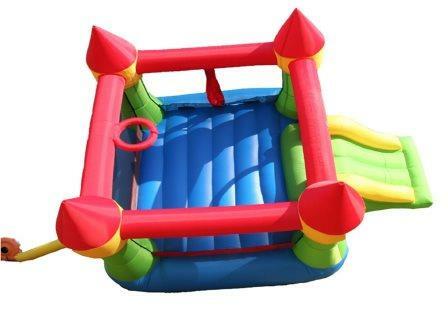 For those smallest hoopers who love to jump but are too little for a full-scale trampoline, there are a variety of inflatable bouncers with basketball goals attached. 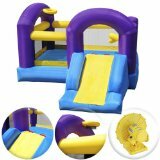 How much fun could your family have with some of these in your backyard! 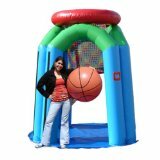 Giant inflatable hoop that stands 8 ft tall! Test your shooting skills in head-to-head competition!